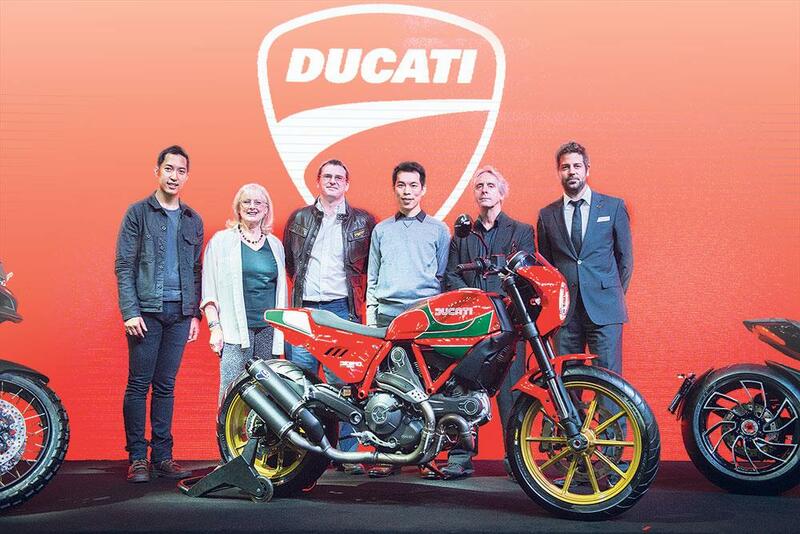 This Ducati Scrambler has been built by Ducati Thailand as a tribute to the legendary racer Mike Hailwood, with his son David on hand to see the first example of just 58 being built. The Hailwood special edition has been built in collaboration with the Hailwood family and celebrates 58 years since the first time Mike ‘The Bike’ Hailwood rode for Ducati; hence just 58 examples being built. The most striking part of the bike is the Hailwood tribute paint scheme which is based on that of the Ducati 900SS Hailwood rode to a famous victory on his return to road racing at the Isle of Man TT in 1978. The official limited-edition model costs 699,000 Thai Bhat, which would equate to a fairly painful £14,029 if it were available in the UK – which it isn’t. MCN understands that around half the 58-bike production run has already been sold, and it’s set to join previous Mike Hailwood replicas as an instant collector’s item. While the price tag is decidedly strong when compared to a standard Scrambler, there have been a decent raft of changes to the bike, including new cast alloy gold painted wheels, an Öhlins rear shock, Termignoni exhaust system, custom single seat unit, LED indicators, new Pirelli Angel GT tyres, a custom headlight cowling and various other Ducati Performance parts. The Hailwood Scrambler Hailwood also boasts a beautiful paint job that pays homage to the one on his 1978 Ducati 900SS, the bike that saw him make a stunning return to the Isle of Man, and to claim victory against all expectation. It’s one of the most famous comeback rides of all time, and the Steve Wynne Sports Motor Cycles 900SS became an instant icon, spawning an official 900SS Mike Hailwood Replica. You can see more about this special edition at www.scramblerhailwood.com.